Adam Rittenberg does a great job covering the Big Ten football teams for his blog which is hosted on ESPN. For a guy so entrenched in the conference, he's very good at remaining unbiased as far as I can tell. In his breakdown of this week's upcoming games [link], he had a very interesting comment about the importance of this week's game to the future of Rich Rodriguez's coaching career at Michigan. Michigan (5-2, 1-2) at Penn State (4-3, 1-2): Simply put, this is the biggest game of Rich Rodriguez's Michigan tenure. Rodriguez and the Wolverines come off of a bye week and need a win to stem talk of a 2009 redux. Penn State got the win it needed at Minnesota, but surrendered 433 yards. The Lions will be tested by Denard Robinson and co., while their quarterback situation remains unsettled after Rob Bolden's apparent concussion. Covering nothing but Michigan football week-in and week-out, and typically only paying close attention to Michigan blogs/media outlets, something I lose sight of how the outside media sees Michigan/Rodriguez. To me, the MSU game was probably the biggest game to-date for Rodriguez. Going into the game undefeated was certainly a huge bonus, but the result of the game only turned up the heat, and reminded fans of what that awful losing feeling was like after 5-straight wins to start the year. I mean lets face it, the success of Denard Robinson and the Michigan offense in those 5 games had shielded some fans honest feelings of the embattled coach. When you're starting QB goes from not knowing if he's the starter to Heisman front-runner in 2 weeks, and your offense is averaging well over 500 yards per game, it's easy to see things through rose-colored glasses. But after two-straight losses, to very good teams I might add, the glow of the 5-game winning streak has definitely worn off. There were those that questioned our good start, saying that we had really not played anyone, and that the Big Ten schedule would reveal our shortcomings. But I will say that while both MSU and Iowa are very good teams, it was not coaching (at least offensively) that lost those games. We all knew before the season began that we would not be contending for the Big Ten title this year, and losses to MSU and Iowa proved that we're not quite at that level...but we're getting there. The next 3 games will prove me either right or wrong. I think these next 3 games (@Penn State, Illinois, @Purdue) are very win-able. I will politely disagree with Adam that this week's Penn State game is Rodriguez's most important game yet. I do think it's a very important game for this team, but I think Rodriguez's job is safe (baring a total meltdown that results in a 3rd straight bowl-less season) If anything, a win will prove that we are getting better, and that 2010 is not 2009. Happy Valley is a terribly tough place to play, especially at night. I don't care how vulnerable Penn State is this year, and they are definitely that. But a road game at Beaver Stadium is a good place to see what your team is made of. Why do I think Rodriguez's job safe? Because until Dave Brandon says otherwise, he's safe in my book. Brandon has come out and said that it's not going be just wins and losses that judge Rodriguez at Michigan. And I think that's probably fair. He's proven that his offense can work here, which is what he was hired to do. He's proven that he can recruit well. And I think that he's proven that he can handle the scorn of the media and fans that truly hate him. Dave Brandon knows that wins can cure everything, but patience is virtue, that frankly, I think it's a trait that is maybe Brandon's best quality. If Brandon came out and said "Coach needs to win x-amount of games to keep his job...", or something like that, then I'd be worried. But it seems to me that Brandon is letting Rodriguez coach his team. After the season, we'll see where we're at. But for now, it's not about wins and losses. I think it's a combination of many things. Are we running a clean program? Are our players going to class and graduating? Are we getting better each week? Is this team trying it's best? Are our mistakes to be blamed solely on coaching? I think those are the kinds of criteria that Dave Brandon is using to judge Rodriguez. At least I hope so. Is this week's game a huge one for Rodriguez? Of course, but it's not any more important that the one after that, and the one after that. For Rodriguez, and the rest of this program, each week is the most important game of the year. It's been like that all season...so why stop now? When you're trying to rebuild something like we are at Michigan, that's how it works. All that you can adequately measure, at least at this point, is your own patience...which like we've said before, is a virtue. It's not about wins and losses? Wow. How the tone has changed. You remind me of a parent who wants to give the kid a trophy just for participating. Maybe we should rub the Michigan football program's tummy and say everything will be all right. I'm amazed at what your view of Michigan football has been reduced to. But then again, you and I tend to disagree on just about everything nowadays. So, really, I shouldn't be surprised. On Dave Brandon's comments, it's customary Michigan PR to maintain their image as "we support our coach, we support our five million dollar investment in our coach." He wouldn't come out and say something negative in the middle of the season, because that wouldn't help or solve anything. ("Oh, btw, this will be Coach Rodriguez's last year. Have a nice day. brb.") But here's something interesting: Tressel has it in his contract that he must beat Michigan (OSU made sure of that after Cooper); but the reverse doesn't hold true for Rodriguez. There's nothing in his contract that says he has to beat Ohio State, otherwise he'd be gone by now. No one here is saying there isn't enough pressure on RichRod, and the coach doesn't snap the ball, block, tackle, or throw to receivers, but at the end of the day, it's his name on the line, not the players. I understand you wanting to hold off judgment, and soon we'll all know if Rodriguez is taking Michigan's program in the right direction. And importantly: is he the right fit for Michigan? Just because he did smashingly at WVU doesn't mean he's the right fit for U-M.
Maybe you're right; maybe we should just give Rodriguez twenty years to implement his system fully. I mean, seriously, we should, when it's not about wins and losses. It will all come down to the team improving, and going to a Bowl game. Michigan WILL WIN @ Penn State, vs. the Illini, and @ Purdue. That's 8 wins as they return home against Wisconsin. 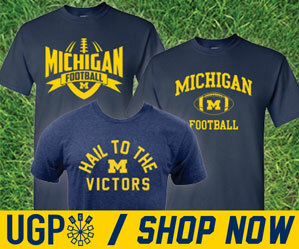 The Michigan fans everywhere need to be positive, and cheer on the Michigan Men, and show them our support. I agree with Adam. This and Purdue are pretty much must-wins with Illinois now being a toss-up. You say it's not about wins and losses, but another 1 or 2 win season in the Big Ten where we finish in the bottom 3 clearly shows a lack of progress. We absolutely need 3 wins, and preferably 4. RR needs to get this team to the middle-pack of the Big Ten come season's end. MSU was a big game being a rivalry, but to put it frankly, they are a much better team than we are this year. When all is written in stone, it will be easy to explain why we lost to them (esp if they beat Iowa on the road Saturday). On the other hand, there is going to be a lot of questions to answer if we lose to a decimated, young and erratic Penn St squad. I don't care how tough the game atmosphere is, we simply cannot lose! This Saturday's game is huge (and I think we'll win handily). It's not about wins and losses? Wow. How the tone has changed. You remind me of a parent who wants to give the kid a true religion jeans trophy just for participating. Maybe we should rub the Michigan football program's tummy and say everything will be all right. I'm amazed at what your view of Michigan football has been reduced to. But then again, you and I tend to disagree on just about everything nowadays. So, really, I shouldn't be surprised. On Dave Brandon's comments, it's customary Michigan PR to maintain their image as "we support our coach, we support our five million dollar investment in our coach." He wouldn't come out and say something negative in the middle of the true religion store season, because that wouldn't help or solve anything. ("Oh, btw, this will be Coach Rodriguez's last year. Have a nice day. brb.") But here's true religion outlet something interesting: Tressel has it in his contract that he true religion sale must beat Michigan (OSU made sure of that after Cooper); but the reverse doesn't hold true for true religion uk Rodriguez. There's nothing in his contract that says he has to beat Ohio State, otherwise he'd be gone by now.